For some of us that live in the northern states with brutal winters, spring often means warmer weather and the ability to run a garden hose without the fear of water freezing up. For everyone in more warmer climates or those in the southern states that have never even seen snow, you may already be using your garden hose or power washer all year long ! So in the spirit of Spring and Spring Cleaning, we decided to take a look at what products exist out there specifically for ATV cleaning, washing off the mud, and general care. 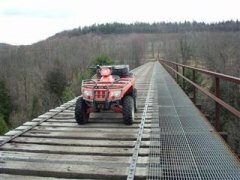 ATV bodies are plastic in most cases, and it's important not to use abrasive chemicals or hard brushes, so you don't scuff up the plastic...let the trail riding do that for you, you won't get a shortage of scratches from all the trees and branches if you're riding in the woods! 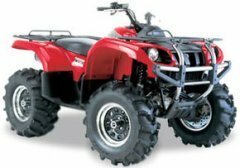 For those of you that like to do some ATV mud'ing, you've probably already adopted a routine for cleaning your ATV after mud-bogging a bit and may have a favorite product you already use. Some even use basic soap and water or a basic car wash. Hey, if it works for you great! Currently available on Amazon for $24.99 which is the same price on the manufacturer's website https://www.slickproductsusa.com but you'll get free shipping if you are a prime member. Slick products free shipping is over $75. Currently available on Amazon for $22.48 but if you check out the manufacturer's page and buy from them, it' $15.95! 1/2 Gallon is currently available on Amazon for $23.99, but the manufacturer has is for $21.99 on their website but you'll most likely have to pay shipping. Currently available on Amazon for $34.90 with free shipping but check the website where it sells for $19.98 but you'll most likely pay shipping unless you order over $99. I use a water jet, it attaches to the garden hose and gives a more powerful spray then just the hose, but not as much as a pressure washer. As for soap, I have been having good luck with Arctic Cat's "Spray and rinse" cleaner. I like winter riding ... or at least the kind I do, on Tracks. Get covered in snow, snow melts when I get home, and The Beast is clean ............ WHAT !?! ?